Predicting the future of our Earth and its climate requires models that contain good representations of the key processes that might take place. Our only way to determine what these processes are, and to test the models, is to look at the past. Numerous “palaeo” [Gk palaios ‘ancient’] archives exist, ranging from tree rings to marine sediments, but ice cores have played a crucial role in helping us to understand how the Earth works. For example, Greenland ice cores have shown us that extremely rapid climate changes centred in the North Atlantic region are possible, and that natural changes in concentrations of greenhouse gases and in climate have been closely linked in the past. Most of what is measured on ice cores is really chemistry. In this article, based on his 2007 ECG DGL, Dr Eric Wolff from the British Antarctic Survey, describes how ice cores work, and summarises some of the key findings that have emerged from measuring their chemistry. Compared to other palaeo-records, ice cores have both advantages and disadvantages. On the plus side, they can be reasonable well-dated (though less so at sites where many years can be accessed); they extend back 800 kyr (800,000 years) in Antarctica and 123 kyr in Greenland so far; they are particularly good at recording signals of the atmosphere; and many variables can be obtained on the same core (for example, climate signals, and the greenhouse gas concentrations). The biggest negative point is that, although ice cores can be obtained at high altitude sites in the mid- and low-latitudes, these are hard to obtain and interpret. As a result, most ice cores come from the polar regions, which give us only a part of the picture about climate change. The information in ice can be thought of in three categories, all of them involving chemistry of different sorts. Firstly, the isotopic content (H218O/H216O, or HDO/H2O ratio) of the water molecules themselves is determined mainly by the temperature at the time of snowfall. The reason for this is related to the slightly lower vapour pressure of the “heavy” molecules, which means that an air mass becomes progressively depleted in heavy molecules on a path from a warm ocean source to a cold polar ice cap. Of course there are complications to the simple story, but the good news for us is that, with care, the isotopic content can be used as a proxy for atmospheric temperature. When the snow falls, it takes with it aerosol particles and some gases that are in the atmosphere at the time. For example, if there has been a large volcanic eruption, SO2 reaches the stratosphere, and eventually this will land on the snow as sulfuric acid, giving a layer of the acid in our ice core a year or so after the eruption (a very useful tool for dating cores). Pollutants such as lead (which I spent part of my career analysing), sea salt from the oceans and sea ice, and soil dust from continents are among the other components found in ice after being trapped in falling and fallen snow. Finally, in places where there is no melting, loose snow turns into solid ice only by being sintered under the pressure of overlying layers of snow. At depths of typically 60-100 m, the ice closes all its channels, and includes tiny bubbles of air that contain a sample of all the stable gases in the atmosphere. If the ice is cracked open again, the air can be collected into canisters and analysed: it is in this phase that CO2 for example can be measured. The longest ice cores drilled have been over 3 km, but these are brought to the surface in lengths of perhaps 3 m at a time by a drill on a long cable. The cores, cylinders often 10 cm in diameter, are logged and partly processed at the field site and then transported to home laboratories in sections that can be cleaned, and then analysed by the state-of-the-art analytical methods required for the low concentrations or low sample volumes available. One aspect of the climate change debate that has rarely been questioned is that the concentrations of greenhouse gases have increased substantially above their normal range in the last two centuries. However, direct measurements in the atmosphere were made only for the last 50 years for CO2 and even less for CH4 (methane). All our other reliable information comes from measurements in the air bubbles in ice cores. Using a site with exceptionally high accumulation rate (MacFarling Meure et al., 2006), very good time resolution has been obtained, including samples enclosed in ice that overlap with the instrumental record and therefore validate the faithful recording of the signal. For CO2 (Figure 1), we learn that today’s mixing ratio of 381 ppmv (parts per million by volume), is some 35% above the value of 280 ppmv that prevailed (with variations of order 5 ppmv) in the millennium before 1800 AD. For CH4, the situation is even more stark, with today’s value of 1730 ppbv (parts per billion, Antarctic concentration) being more than double the pre-industrial mixing ratio of around 750 ppbv. While there were natural changes in the concentrations of both gases during major climate changes in the past (discussed later), it is clear that today’s concentrations of both gases are considerably higher than anything seen in the last 650 kyr, and probably much longer. In recent years, more demanding (because of the small volumes of air available from the ice) measurements of isotopic ratios (e.g. 13CO2) in these gases have started to be made, giving new clues about the origin of recent changes. Although numerous cores covering a few centuries have been drilled, with many different analyses made, I will discuss just one other example of recent change here. Lead (Pb) occurs naturally in polar snow and ice only at the ng/kg level. However, it was shown that, in Greenland ice, the concentration had risen during the industrial era by about a factor 200, firstly due to metal smelting, and then due to the use of lead additives in petrol. Furthermore, as unleaded petrol was introduced in North America and then elsewhere, the concentration again decreased by an order of magnitude during the 1970s and 1980s (Boutron et al., 1991). My own group showed that even Antarctica was not immune, with concentrations (although always tiny compared to any water sample from Europe) increasing by a factor 5 or more, and then starting to decrease again. This story shows how the results of emissions in industrial areas reach the whole globe, but also how measures to clean such emissions really do have an effect. 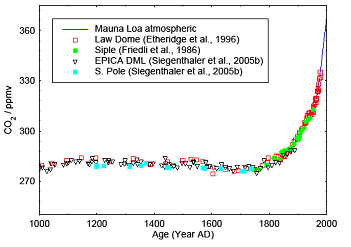 Figure 1: Atmospheric CO2 over the last 1000 years from a range of Antarctic ice cores, along with values measured in the atmosphere at Mauna Loa since the 1950s. The figure shows the level of natural variability and the recent rise. From a range of paleoclimate records, it is well-known that the most prominent feature of climate over the last few hundred thousand years has been successive warmings and coolings, accompanied roughly every 100 kyr by the waxing and waning of great ice sheets. At the height of the last cold (glacial) period 20 kyr ago (the last glacial maximum, LGM), large areas of North America and northern Europe were covered in thick ice sheets, Today we are in one of the short “interglacial” warm periods. A number of Antarctic ice cores have now penetrated more than one of these so-called glacial cycles. The deepest core drilled so far, the Russian-led Vostok core, reached just over 400 kyr into the past. It showed (Petit et al., 1999) that Antarctica also cooled (by around 9 degrees) in the LGM. Most strikingly, it showed that CO2 and Antarctic temperature tracked each other over the period of the core, with CO2 levels typical of the pre-industrial period during warm periods, and mixing ratios around 180-200 ppmv in glacial maxima. This close coupling shows us about natural controls on the exchange of carbon between different parts of the environment and also shows us some of the feedbacks that amplified small changes in incoming solar radiation (due to changes in Earth’s orbit) into major global climate shifts. CH4 also rises and falls with climate. I have been lucky to be part of the European team that has drilled another core, extending our knowledge back to 800,000 years before present. The European Project for Ice Coring in Antarctica (EPICA) is a consortium of laboratories and agencies from 10 nations, who have drilled two cores in Antarctica, the oldest and longest being at Dome C. The core site is at 3233 m above sea level, and receives the snowfall equivalent of just 2.5 cm of rain each year. A team of typically 14 scientists and 7 core drillers arrived at the featureless site each summer to retrieve the core, and to section and analyse it. The drilling was completed to 3270 m depth in December 2004. The core had first to be dated. This has been achieved through an ice flow model (that uses physical knowledge to estimate the initial thickness of each annual layer, and the way it thins with time as the ice flows). However, the unknowns in this model have been controlled by a large range of chemical analyses: for example, sulfate spikes that can be traced to volcanic eruptions of known date, or to the same unknown eruption in an already-dated core, and methane changes that occur at the same time in Antarctica and in Greenland (where they were already dated). A peak in 10Be concentration occurring at an age of 780,000 years before present has a particular significance; 10Be is produced by cosmic rays in the atmosphere, and these penetrate most easily when the Earth’s magnetic field is weak. The peak seen at Dome C represents the last time the magnetic field flipped (and was therefore weak for a sustained period); because the date of this flip is already known it confirms our dating that places the deepest ice we can use at Dome C at just beyond 800,000 years ago. The climate signal (deuterium values interpreted as Antarctic temperature) at Dome C shows a continuation of the 100,000 year periodicity seen at Vostok (EPICA Community Members, 2004). However, the amplitude of the cycles in the earlier parts of the record is much weaker (with interglacial temperatures significantly lower than in the recent ones), and it poses an additional challenge to us to understand why this is so. However, I believe it is crucial that we do so, because we cannot really claim to understand climate if we don’t know why we are now in an interglacial, and in an interglacial with the characteristics it has. Numerous other chemical measurements give us access to knowledge of other aspects of the environment over long time periods. Sea salt in ice cores arises from aerosol produced at the sea ice surface as well as from open water. In the interpretation I favour, the record of sodium ion concentrations tells us about past sea ice extent, a key variable for understanding climate. Not surprisingly, we therefore find higher concentrations in cold periods, and the Dome C sodium record (Wolff et al., 2006) can tell us about the relative timing of changes in sea ice, climate and CO2. Sulfate concentrations, after correction for the part coming directly from sea salt, and bearing in mind a sporadic volcanic contribution, arise from the oxidation of dimethyl sulfide (DMS), which is produced by some marine organisms. Surprisingly, the flux of sulfate to the ice sheet varies only within narrow bounds over glacial-interglacial cycles, contradicting earlier work that suggested major changes in marine productivity in the relevant section of the Southern Ocean. If such changes occurred, they must have occurred further north than the section of ocean that Dome C effectively samples. Figure 2: Deuterium (Antarctic temperature proxy) from the EPICA Dome C ice core (EPICA Community Members, 2004), along with a composite of CO2 (Siegenthaler et al., 2005) and CH4 (Spahni et al., 2005) data over the last 650,000 years from the EPICA Dome C and Vostok (Petit et al., 1999) ice cores. Geochemical studies (using a range of isotopic and chemical fingerprints) on a few samples have previously shown that most of the terrestrial dust reaching Antarctica in cold periods at least came from Patagonia in South America. The huge (~20-fold) increases in the flux of calcium or iron (mainly terrestrial elements) during cold periods (Wolff et al., 2006) shows that large climate changes must have occurred at these times in Patagonia. They also indicate the pattern of deposition of potential nutrients (especially iron) into the ocean, something that may have been one contributor to changes in the uptake of CO2 from the atmosphere. Taken together, the different measurements made for example on the Dome C core show the interplay of different parts of the Earth System, and therefore give clues to the mechanisms that need to be represented in models. Recent measurements have given us otherwise unavailable information about what changes have actually occurred. However, there is certainly potential to learn more. The international ice core community has recently developed an agenda for the next decade or more, with a series of priority projects. One of these for example aims to extend the Antarctic record to about 1.5 million years, a time when we know that the tempo of cold and warm climate was paced at 40 kyr intervals instead of 100 kyr. Why was that, and why does it no longer pertain today? Ice cores can help us answer that. At the other end of the spectrum, detailed measurements on well-dated records of the last 2000 years can fill gaps in our knowledge of the spatial pattern of recent climate change and of the natural variability on which it is superimposed. It goes without saying that chemistry, including existing techniques, but also new analytes, more sensitive methods, and faster measurements, is crucial to the future of ice core science. I am grateful to my colleagues at BAS, and in the international ice core community, especially the EPICA project, for sharing the data that made this presentation possible. Boutron, C. F., Görlach, U., Candelone, J.-P., Bolshov, M. A., and Delmas, R. J. (1991). Decrease in anthropogenic lead, cadmium and zinc in Greenland snows since the late 1960s. Nature 353, 153-156. EPICA Community Members. (2004). Eight glacial cycles from an Antarctic ice core. Nature 429, 623-628. MacFarling Meure, C., Etheridge, D., Trudinger, C., Steele, P., Langenfelds, R., van Ommen, T., Smith, A., and Elkins, J. (2006). Law Dome CO2, CH4 and N2O ice core records extended to 2000 years BP. Geophysical Research Letters 33, L14810, doi:10.1029/2006GL026152. Petit, J. R., Jouzel, J., Raynaud, D., Barkov, N. I., Barnola, J. M., Basile, I., Bender, M., Chappellaz, J., Davis, M., Delaygue, G., Delmotte, M., Kotlyakov, V. M., Legrand, M., Lipenkov, V. Y., Lorius, C., Pepin, L., Ritz, C., Saltzman, E., and Stievenard, M. (1999). Climate and atmospheric history of the past 420,000 years from the Vostok ice core, Antarctica. Nature 399, 429-436. Siegenthaler, U., Stocker, T. F., Monnin, E., Luthi, D., Schwander, J., Stauffer, B., Raynaud, D., Barnola, J. M., Fischer, H., Masson-Delmotte, V., and Jouzel, J. (2005). Stable carbon cycle-climate relationship during the late Pleistocene. Science 310, 1313-1317. Spahni, R., Chappellaz, J., Stocker, T. F., Loulergue, L., Hausammann, G., Kawamura, K., Flückiger, J., Schwander, J., Raynaud, D., Masson-Delmotte, V., and Jouzel, J. (2005). Atmospheric methane and nitrous oxide of the late Pleistocene from Antarctic ice cores. Science 310, 1317-1321. Wolff, E. W., Fischer, H., Fundel, F., Ruth, U., Twarloh, B., Littot, G. C., Mulvaney, R., Rothlisberger, R., de Angelis, M., Boutron, C. F., Hansson, M., Jonsell, U., Hutterli, M. A., Bigler, M., Lambeck, K., Kaufmann, P., Stauffer, B., Stocker, T. F., Steffensen, J. P., Siggaard-Andersen, M. L., Udisti, R., Becagli, S., Castellano, E., Severi, M., Wagenbach, D., Barbante, C., Gabrielli, P., and Gaspari, V. (2006). Southern Ocean sea-ice extent, productivity and iron flux over the past eight glacial cycles. Nature 440, 491-496. This article is based on a presentation by Dr Wolff at the ECG’s 2007 Distinguished Guest Lecture and Symposium ‘Environmental Chemistry in the Polar Regions’.